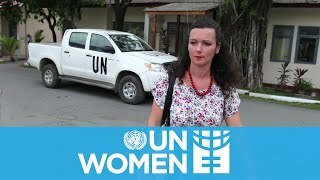 Why work for UN Women? A leading global gender equality entity – Innovative programmes and in-depth expertise make UN Women a one-stop global centre for advancing gender equality. A brilliant and diverse community of gender equality advocates – Eighty per cent of UN Women posts are located in the field. Join more than 2,000 people, representing more than 150 different nationalities, working on challenging, global and highly rewarding initiatives. Real and meaningful work to empower women and girls around the world – UN Women works with governments and civil society to design and implement laws, policies, programmes and services to enable women and girls to claim their rights and expand their opportunities. Our values are underpinned by the United Nations values: respect for diversity, integrity and professionalism. Find out more about UN Women’s values and competencies. Be part of a unique mandate to achieve gender equality, end all forms of discrimination and empower all women and girls and help change the course of the 21st century. Login instructions for internal (UN Women) candidates. UN Women will continue to simultaneously use the UNDP recruitment system to advertise vacancies until the transition to the new recruitment system has been completed. For applications to vacancies posted on the UNDP system, a UN Women Personal History Form (P11) must be completed and attached as part of the online application in place of the CV/résumé. UN Women is one of the UN organizations that participates in the Junior Professional Officer (JPO) programme. The JPO programme allows young professionals to acquire hands-on experience in the development field under the sponsorship of their respective governments. Visit the JPO website for more information. The United Nations Volunteers (UNV) programme recruits volunteers for assignments throughout the United Nations system, including UN Women. For information and application procedures, please visit the UNV website. UN Women is committed to diversity and inclusion within its workforce and encourages qualified women and men of all national, religious and ethnic backgrounds, including persons living with disabilities, to apply to become a part of our organization. Find out more about UN Women’s global approach to achieving gender equality and the empowerment of women. Join us! Ask a climate activist: Why is it important to engage women in promoting biodiversity and sustainable waste management in the Caribbean?